The ADVANCE project, which I am currently working on, seeks to “improve Ghana’s agricultural sector by increasing competitiveness in domestic, regional and international markets.” The way to do this is to give smallholder farmers (defined as those with 1-2 hectares of land, or renters) better access to fertilizer and chemicals, better access financing and seed varieties that the market demands, and more efficient machinery. This process is called “upgrading,” and it is the key to import-substitution for the rice, and export competitiveness for soya. The end goal is food security, and the means is the commercialization of the agriculture sector. Organizations like the United Nations and the World Bank say the practice, if done equitably, could help feed the growing global population by introducing large-scale commercial farming to places without it. But others condemn the deals as neocolonial land grabs that destroy villages, uproot tens of thousands of farmers and create a volatile mass of landless poor. Making matters worse, they contend, much of the food is bound for wealthier nations. Ever since the 2008 world food crisis, wealthy nations have seen the dangers in becoming reliant on other countries for food production and, in anticipation of the next one, have begun scrambling to buy land in Africa. Likewise, hedge funds see the writing on the wall and are participating in the feeding frenzy too. The concern is that people will be displaced en masse from their lands and left with nothing to show for it. On the other hand, many of them are technically squatters, with the actual deed for the land belonging to the government or a major landholder. Then again, one might find it difficult to impress this on a third-generation farmer living on the same piece of land as his grandfather. In Mali, about three million acres along the Niger River and its inland delta are controlled by a state-run trust called the Office du Niger. In nearly 80 years, only 200,000 acres of the land have been irrigated, so the government considers new investors a boon. “Even if you gave the population there the land, they do not have the means to develop it, nor does the state,” said Abou Sow, the executive director of Office du Niger. 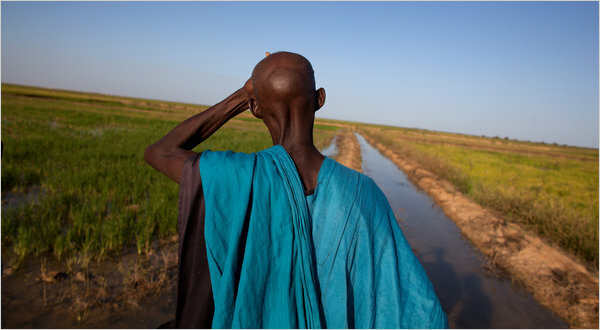 “The Libyans want to produce rice for Libyans, not for Malians,” said Mamadou Goita, the director of a nonprofit research organization in Mali. He and other opponents contend that the government is privatizing a scarce national resource without improving the domestic food supply, and that politics, not economics, are driving events because Mali wants to improve ties with Libya and others. Oh well. It’s a complicated issue and I’m not sure where I stand. On the one hand, investors with expertise will develop the land and make it productive. On the other hand, the people bearing the burden for these investments will be the poor and the poorest of the poor. The country elites and investor nations will benefit, and, in the long run, the countries of investment may move a step closer to long-term food security. But, in the meantime, the families working the lands now will have to find a new place to live. Tough question. Lot of the ‘Mystery of Capital’ problems evident here. I’d love to see the land put to its most productive use but in a way that gives the poor equity in their success, i.e., earning 35 cedis for NO labor each year while the land is put to better use. This wouldn’t solve all the problems, but I’m attracted to the equity idea. If you think that a village’s best chance at increasing productive employment is through investments that will benefit a minority in the near-term, providing equity in the enterprise to the least well off may be a way to keep them engaged and directly connected to their success. Hey Chris – sorry for the delay in responding to this. The catch 22 of developing the agriculture industry is that a) when you make the process more efficient and make smallholders more productive, the price at the end market goes down, meaning they are undercutting their own selling price, even though the market overall is better off, and b) it is hard to reach the economies of scale necessary to achieve real cuts in cost of production without consolidation, which risks putting smallholder farmers out of business. The Philippines has been going through a major land redistribution. Large landowners used to have haciendas, and employ hundreds of families. They could achieve economies of scale through mechanization, fertilizer, technical knowledge, etc. In addition, they could afford to pay their workers a salary (albeit, a small one) during the months when the cane fields are growing, which takes 6 months. When the land is redistributed in 1.5 hectare plots, the former workers now have land they don’t have the technical skills or financial resources to properly work. The end result is lower productivity and less income for everyone.